Holeshot artist Mike Alessi was back in form tonight. The MotoConcepts rider led James Stewart, Ryan Villopoto, Ken Roczen and Ryan Dungey into the first turn, but Stewart didn’t hold second for long. The Yoshimura Suzuki rider washed his front end out while braking out of the start straight in the opening lap. Villopoto had fallen back a couple positions and allowed Roczen to inherit the lead. Roczen failed to double the finish line at one point, giving second place back to Villopoto. Villopoto, Roczen and Dungey made a charge and caught up to Mike Alessi and each rider passed him at some point in the same lap. Villopoto held the lead until he lost traction exiting the corner before the triple and was forced to double. 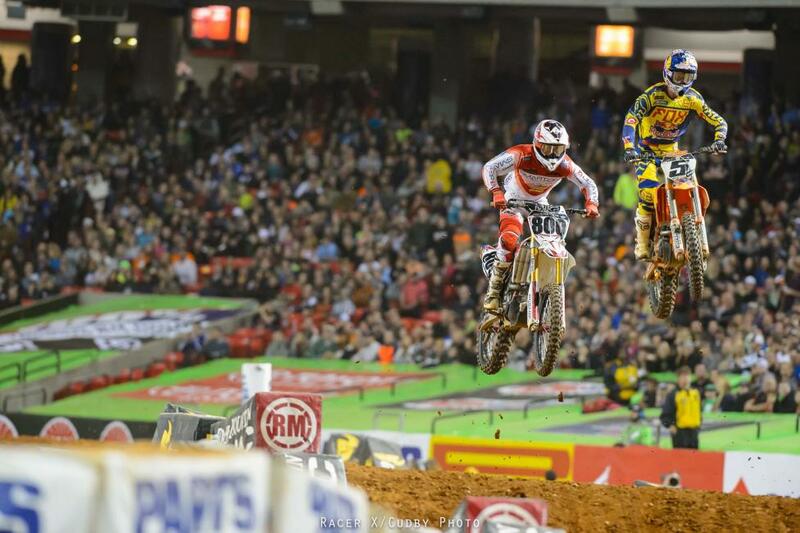 Roczen passed Villopoto in the air and went on to win the race. 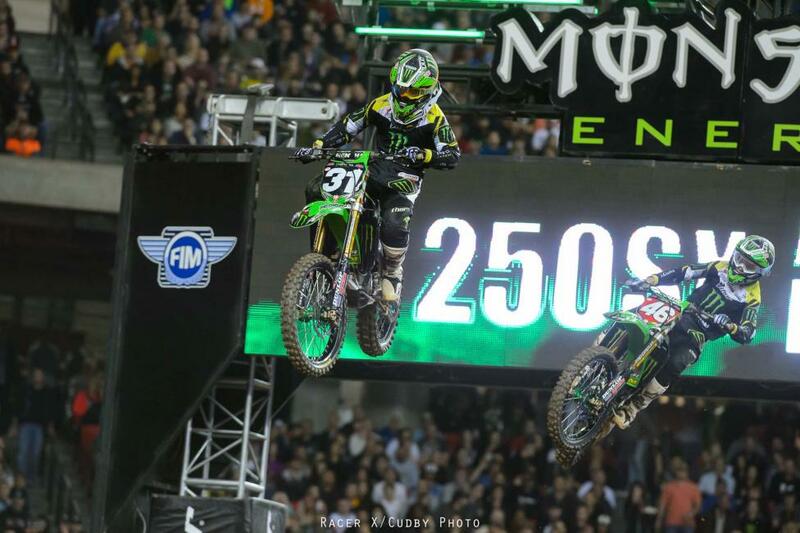 Villopoto kept him honest, but was never able to make a move. Dungey finished behind Villopoto in third. 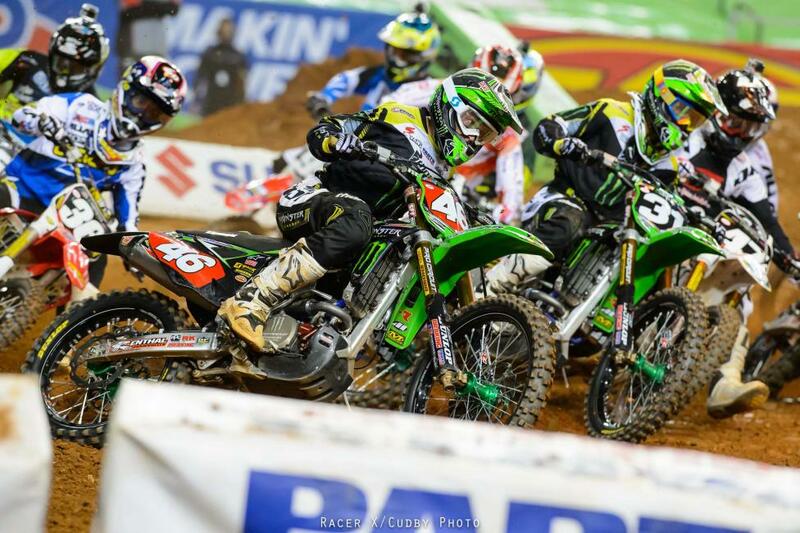 After coming from the LCQ, Adam Cianciarulo pulled the 250SX main event holeshot from the far outside. He led for a few lanes before making a mistake in the second rhythm section, turning over the lead to his Monster Energy/Pro Circuit Kawasaki teammate Martin Davalos. We’ve seen Davalos lead main events plenty of times, but he has never been able to seal the deal and get a win… until tonight. After inheriting the lead from Cianciarulo, Davalos led every single lap en route to his first-ever 250SX main event win. Cianciarulo rode consistently for the rest of the race and finished runner up to Davalos. 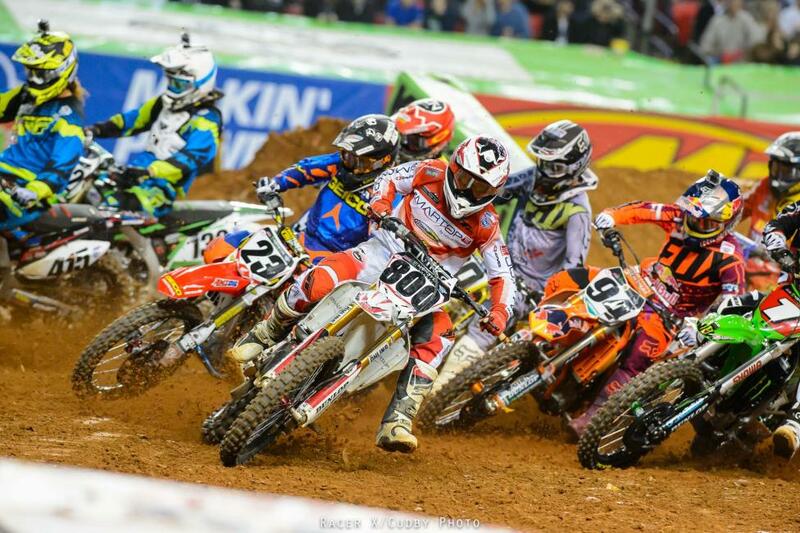 For the second-straight week, the Eastern Regional 250SX class has seen a first-time winner. 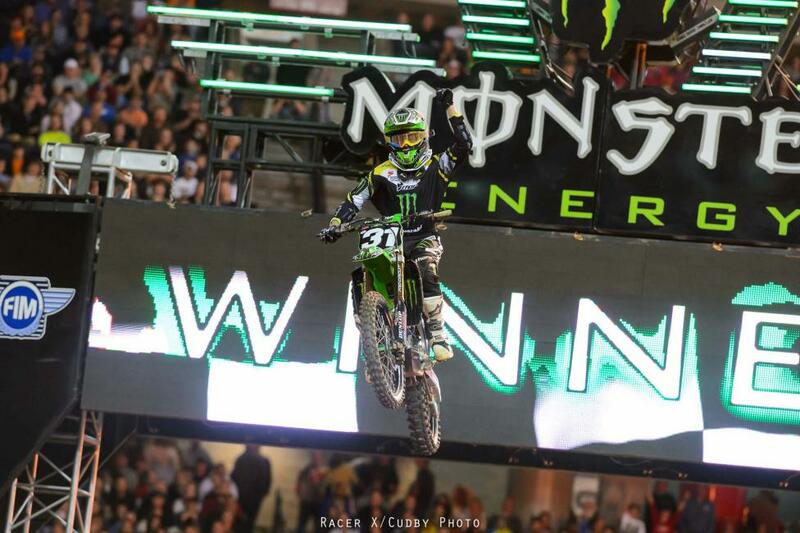 It was supercross rookie Adam Cianciarulo with the win at the East opener in Texas last week, but this week it was 250SX veteran and fellow Monster Energy/Pro Circuit Kawasaki teammate Martin Davalos grabbing the W. He has won plenty of heat races and led many main event laps through the duration of his nine-year 250SX career, but has always been shy of winning a main event until tonight. His family had even traveled to America from Ecuador to watch this particular race, making his win that much more special. 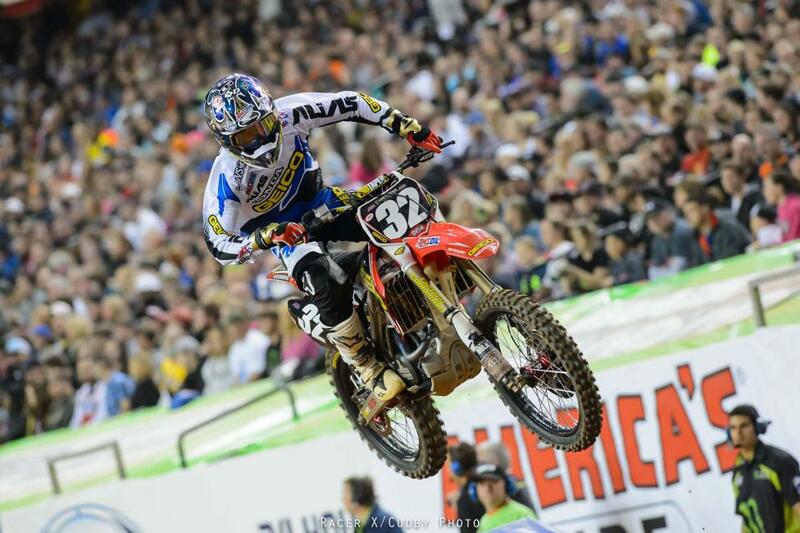 450SX rookie Ken Roczen took his second career win tonight in the Georgia Dome. The former 250SX champion got a top-five start in the main event and capitalized on a mistake made by race leader Ryan Villopoto. Ryan Dungey wasn’t far off of the two riders’ mark, so any additional mistakes may have altered the outcome of the race. 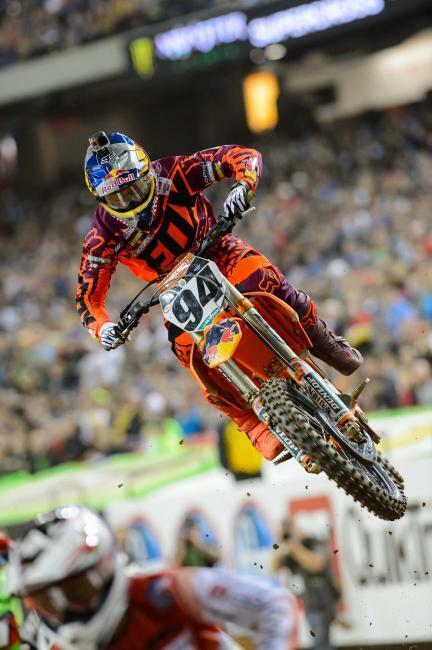 However, Roczen stayed consistent on the challenging track once he took command of the lead. Holeshot artist Mike Alessi was back in form tonight. The MotoConcepts rider led James Stewart, Ryan Villopoto, Ken Roczen and Ryan Dungey into the first turn, but Stewart didn’t hold second for long. The Yoshimura Suzuki rider washed his front end out while braking at the end of the start straight in the opening lap. Villopoto made a mistake on the first lap and fell back a few positions. This put Roczen into second behind Alessi. Roczen failed to double the finish line at one point, giving second place back to Villopoto. Villopoto, Roczen and Dungey made a charge and caught up to Alessi and each rider passed him at some point in the same lap. Villopoto held the lead until he lost traction exiting the corner before the triple and was forced to double. 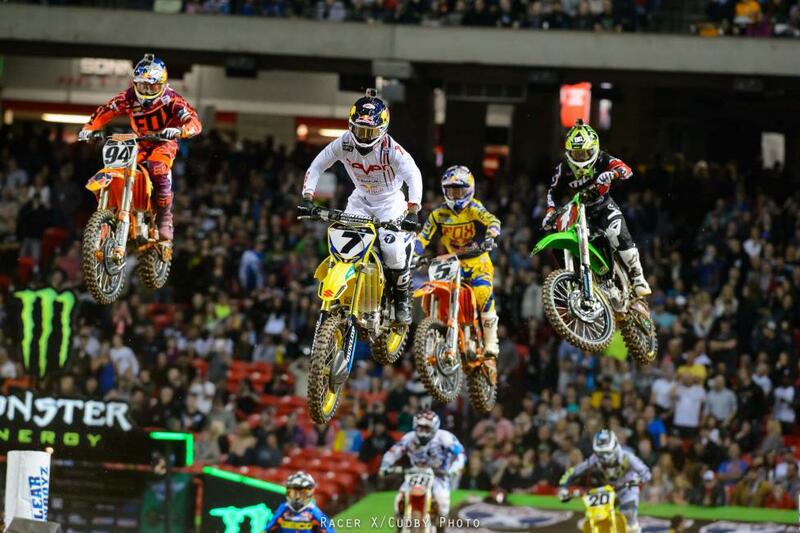 Roczen passed Villopoto in the air and went on to win the race. 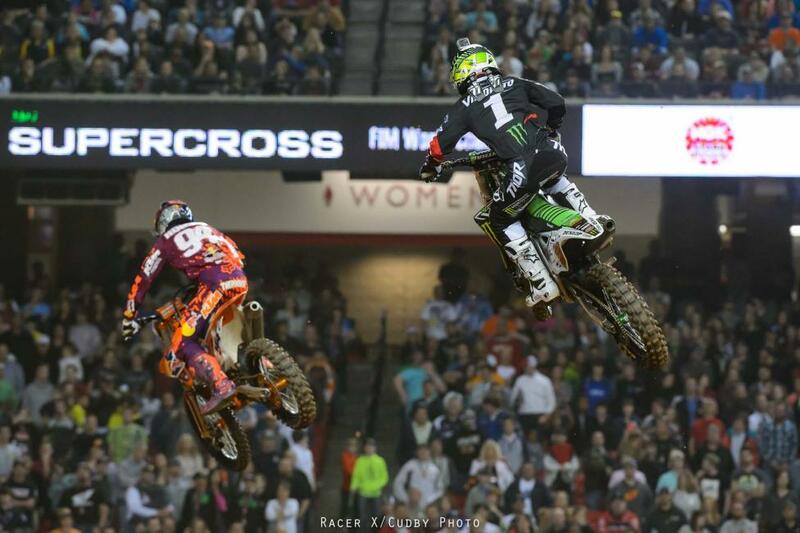 Villopoto kept him honest, but was never able to make a move. Dungey finished behind Villopoto in third. 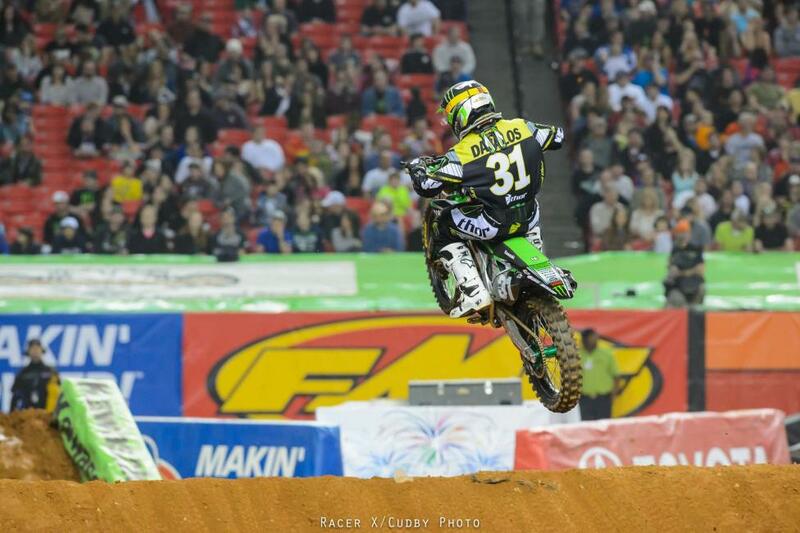 After coming from the LCQ, Adam Cianciarulo pulled the 250SX main event holeshot from the far outside. He led for a few lanes before making a mistake in the second rhythm section, turning over the lead to his Monster Energy/Pro Circuit Kawasaki teammate Martin Davalos. We’ve seen Davalos lead main events plenty of times, but he has never been able to seal the deal and get a win… until tonight. After inheriting the lead from Cianciarulo, Davalos led every single lap en route to his first-ever 250SX main event win. Cianciarulo rode consistently for the rest of the race and finished runner up to Davalos. Behind the two Monster Energy/Pro Circuit Kawasaki riders was close battle for third between Anthony Rodriguez, Blake Wharton, Vince Friese and Justin Bogle. One rhythm section vastly changed the close battle between the four riders. Wharton slid out in the corner entering the lane, letting both Friese and Bogle by. Rodriguez crashed hard stepping off of a tabletop and DNF’d the race. Friese got caught up in the mix momentarily but Bogle made it through clean to take third for the remainder of the race. 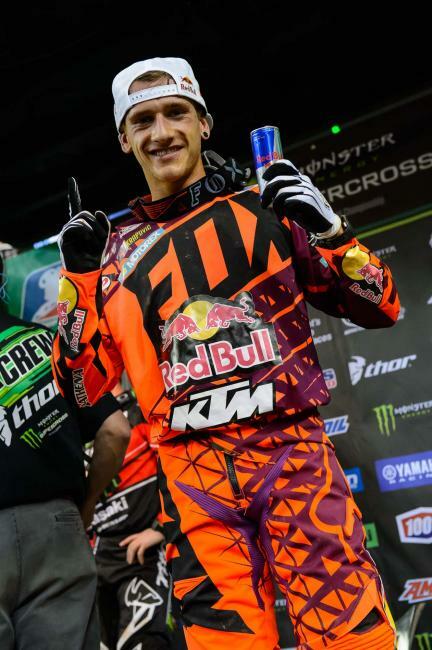 Roczen took home his second-career 450SX win. Martin Davalos wins his first-ever 250SX main event.